This article refers to the journalist and contributing editor for Wired magazine. For the novelist and creator of the Roger Rabbit universe, see Gary K. Wolf. 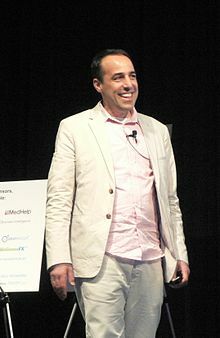 Gary Wolf is an American writer, contributing editor at America's Wired magazine, and co-founder of the Quantified Self. Among his other Wired stories, Wolf is the author of "The Curse of Xanadu," about Ted Nelson and Project Xanadu, and "The World According to Woz", about Steve Wozniak. In 2007, with Kevin Kelly, Wolf co-founded the Quantified Self, a collaboration of users and tool makers who share an interest in self-knowledge through self-tracking. In 2010, he spoke about the movement at TED. Wolf's parents are noted epilepsy researcher Harold H. Wolf and professor of education Joan Silverman Wolf. ^ a b Singer, Emily. "The Measured Life". MIT. Retrieved 2011-07-05. ^ Gary Wolf (June 1995). "The Curse of Xanadu". Wired magazine. Retrieved July 3, 2011. ^ "What they say". Ted.hyperland.com. Retrieved 2011-05-26. ^ "Letters about "The Curse of Xanadu"". Wired.com. 2009-01-04. Retrieved 2011-05-26. ^ Wolf, Gary. "Quantified Self". Gary Wolf. Archived from the original on 2012-03-27. Retrieved 2012-03-26. ^ Wolf, Gary. "The quantified self". TED (conference). Retrieved 2012-03-26.